The report forecasts that the world gas industry will grow by USD 35 Billion by 2020, of this about 10% of the growth will be accounted by growth in industrial gases market in India. The market for industrial gases is highly fragmented in India, with the presence of domestic companies, multinationals, as well as small players. The majority of the market is held with multinational manufacturers, closely followed by domestic players. 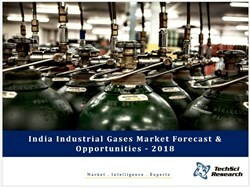 According to recently published report by TechSci Research “India Industrial Gases Market Forecast & Opportunities, 2018”, the industrial gases market in India is expected to witness CAGR of more than 14% over 2013-2018. INOX Air Products Limited held the major market for industrial gases in 2012 and is expected to maintain it by 2018. Industrial gases are gases which are specifically manufactured for industrial applications in wide range of industries, such as oil & gas, petrochemicals, chemicals, engineering etc. These gases are synthetically produced using air separation units by cryogenic distillation of air. The major atmospheric gases are Oxygen, Nitrogen and Argon which are present in high volume in the air. These gases have major application in Iron & Steel and Light Engineering Industry, which makes these industries as major end user industries. “India Industrial Gases Market Forecast & Opportunities, 2018” report analyses the key trends, challenges and opportunities in the industrial gases market in India. It adds that India is one of the largest markets for industrial gases in the Asia-Pacific, and the region is expected to witness high growth due to increase in demand from China, India and South Korea. The report forecasts that the world gas industry will grow by USD 35 Billion by 2020, of this about 10% of the growth will be accounted by growth in industrial gases market in India. The major reason can be attributed to growth in its end user industries, specifically iron & steel industry which is the largest customer for industrial gases in India. Light engineering industry, refineries as well as iron & steel industry are the major industry to measure the economic growth in the country. Hence, development in these industries will drive industrial gases market in India. “Iron & Steel industry is the major target market for industrial gases in India, with over 70% of the industrial gases being consumed by metallurgy plants. Growth in metallurgy industry in India, coupled with favourable government initiatives is driving capacity expansion in India iron & Steel Industry with majors, such as Tata Steel and SAIL. The major market for industrial gases is driven by growth in tonnage plants, which are subsequently rising in India, coming under long term contract with industrial gas majors such as INOX Air Products Limited, Linde India and Praxair India Limited. These market developments are expected to positively influence industrial gases market in India,” said Mr. Karan Chechi, Research Director with TechSci Research, a research based global management consulting firm. ‘India Industrial Gases Market Forecast & Opportunities, 2018’ has evaluated the future growth potential of India Industrial Gases market and provides statistics and information on market structure, industry behaviour trends. The report includes industrial gases market projections and demand forecasting. The report is intended to provide cutting-edge market intelligence and help decision makers to take sound investment evaluation. Besides, the report also identifies and analyses the emerging trends along with essential drivers, challenges and opportunities available in industrial gases market in India.